Shopping festivals in India struggle to find takers. Enjoyed by men and women alike, shopping is a favourite pastime for people across cultures, countries and religions. Today, shopping festivals are being organised in different parts of the world, catering to varied needs and tastes of the shoppers worldwide. Some of the prominent shopping festivals are organised in Dubai, Singapore and Thailand. Shopping festivals are also held in India, though not on a very large scale. Shopping festivals give retailers the opportunity to come together to promote their product and services under a single platform. The joint publicity and marketing provide economy of scale, particularly for the smaller shops, and allow them to reach out to a larger audience, including those based overseas. For the shoppers, on the other hand, shopping festivals are an opportunity to purchase a wide range of products and services at discounted rates as well as receive free gifts and get the chance to participate in lucky draws. It implies to be a win-win situation for both the retailers and the shoppers. Apart from being the most successful shopping festivals across the Middle East, Dubai Shopping Festival (DSF) and Dubai Summer Surprises (DSS) carry the added benefit of being managed by an official government agency, Dubai Events and Promotions Establishment (DEPE). DEPE is the agency responsible for promoting Dubai as a year-round destination for events and retail promotions and works closely with public and private sector partners across the retail and events sectors. In addition, both DSF and DSS enjoy a carefully planned and unique blend of shopping, winning and entertainment. After a decade-and-a-half, DSF has transformed itself into a global event in terms of stature and appeal. Similarly, since its inception in 1998, DSS has successfully managed to draw thousands of visitors and stimulate tourism during the summer season. It is worthy to note that while DSF promotes Dubai as a global shopping hub, DSS is more focused on promoting Dubai as a summer holiday destination. Like Dubai, every year Singapore too hosts its Grand Singapore Sale, one of the most elaborate shopping festivals held between the months of May and August. From branded labels to shops selling local stuff, visiting this Singapore shopping festival is a shopper’s delight. During this festival, one can avail discounts up to 70 per cent, great value add offers and some interesting gift vouchers. During this time shopkeepers lower their prices to attract more visitors and it is during this festival that wide ranges of products are freed to enrich the shopping experience in the country. When these shopping festivals were first launched, the focus was to promote the local industry, but over the years, they have contributed to the development and promotion of trade and commerce across nations. “These festivals are now extended to businesses outside the country, with overseas companies and products being an integral part of the festivals. At the same time, the shoppers are no longer confined to the local populace. We see many overseas tour groups timing tours to coincide with these festivals. In short, these festivals have become an important occasion for tourists. Thus, in addition to the direct benefit to the shops participating in the festival, there are benefits to other players in the economy, for example, hotels, transportation, eateries and other tourists sites,” says Hernaikh Singh, Chief Executive Officer, Singapore Indian Chamber of Commerce & Industry. “There is much potential for retail players. On their own, they may not have the resources and financial clout to do extensive publicity and marketing to promote their products and services. However, by coming under the umbrella of these festivals, they are able to ride on the combined promotional and marketing efforts and, thereby, reach out to a larger audience, including overseas shoppers,” Singh adds. Both DSF and DSS play an integral role in promoting Dubai as a unique global shopping tourism destination to support Dubai’s strategic plan of attracting 15 million visitors by the year 2015. “During DSF 2011, visitors and residents spent around AEDv15 billion, including air tickets, hotels, shopping, restaurants and many other sectors, which had a positive impact on the overall local economy. Also, around 40 per cent (AED 5.9 billion) of the overall spent was generated by regional and international visitors – with the highest number of visitors hailing from India, England and Saudi Arabia,” says Suhail. One of the key attractions of these shopping festivals is the discounts offered by the retailers. Otherwise, there is no real incentive for shoppers as they can get regular-priced items any time. “The discounts are a great incentive for shoppers and many shops offer extensive discounts. At the same time, free gifts and lucky draws are often organised by the shops, either individually or collectively. From what I know, shops do report brisk business during the business festivals,” Singh adds. Suhail says shoppers can look forward to a reduction of up to 75 per cent on regularly priced items at these festivals, which can result in significant savings for the shopper. Each of these festivals also supplements their retail discounts with an array of ‘chances to win’ offerings, including raffles, competitions and draws. DEPE, being one of the agencies working under Department of Economic Development, also keeps a close watch over all the participating retailers to make sure that the discounts offered are real and honest. This happens through a system of monitoring and random inspections during the days of each festival. Singh says the response for these festivals has been great. This explains why these festivals are held regularly and have extended to many other countries. There is normally a wide range of products and services at these festivals. As such, various groups of people – working people, housewives, teenagers, students, among others – are seen at these festivals. In the recent years, as mentioned earlier, a growing number of tourists have also started participating in these festivals. “We always assign a reputable research agency to analyse our festivals and events. According to the latest study that we did in DSF 2011, we found that we enjoy an excellent response from our visitors year on year. 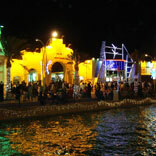 Across UAE residents and visitors, a total of 4 million people participated in DSF 2011. Of them, three-quarters (77 per cent) of international visitors to DSF 2011 reported the festival exceeded their expectations,” Suhail says. A total of 885,000 regional and international visitors came to Dubai during the DSF period, with the largest proportion coming from India, Britain and Saudi Arabia (11 per cent, 8 per cent and 8 per cent, respectively). The boost to Dubai’s economy from retail, travel and hospitality spend during the festival totalled AED 15.1 billion, including AED 5.9 billion spent by regional and international visitors, and AED 6.6 bn spent by residents of other emirates. While shopping is a pastime for many in India, when it comes to shopping festivals, we do not see much happening. There are quite a few shopping festivals held in India every year – Gurgaon Shopping Festival, Goa Shopping Festival, Delhi Shopping Festival, Pune Shopping Festival, Pondicherry Shopping Festival, Mumbai Shopping Festival and Kolkata Shopping Festival to name a few – but the response and footfall are nowhere even close to what is registered in the international festivals. The Gurgaon Shopping Festival, which was started in 2010 to coincide with the Commonwealth Games, and thus, attract a number of visitors, fizzled out soon after its launch. The festival, which was meant to continue for a month, had to be wrapped up in 15 days. In those 15 days, the festival registered a footfall of only about 10,000 people, which is, on an average, less than a 1,000 people per day. Gurgaon Shopping Festival has not been held after its first debacle. Similarly, other shopping festivals in India too fail to impress. The main reason behind shopping festivals not becoming a runaway success in India is the lack of government support. Sanjay Sharma, a Tourism expert, says shopping festivals are the biggest drivers for tourism in any country, and due to lack of government support, both the shopping festival and the tourism industry are suffering. “The Dubai Shopping Festival is the biggest shopping event in the world. It is not hidden from anyone that it is a phenomenal success every year. The biggest reason behind this success is that the Department of Tourism in Dubai supports the festival fully. It not only provides tax and monetary benefits to both the sellers and the buyers, it also promotes the event in a big way,” says Sharma. Last year, the number of tourists in India was 60 lakh, while that in Dubai was 90 lakh. “Given the size and population of India and Dubai, the difference is huge,” Sharma adds. Another major difference lies in the fact that during the DSF, hotels in Dubai slash their tariffs for the benefit of tourists, while hotels in India hike their tariffs in view of the increased inflow of tourists. “If we do not receive all-round support, shopping festivals are never going to be successful in India. The government should not only promote the festivals held in India, but also help the organisers in bringing out ads, which can be done at subsidised rates if they are released by the government. There should be some exemption in the tax structure as well,” Sharma says. The only successful shopping festivals in India, he reminisces, were held 15 years ago in Madhya Pradesh. “Both the Ujjain Shopping Festival and the Gwalior Shopping Festival, which were held for 10 days, received good response because the Madhya Pradesh government had stood firm to support these festivals, providing tax and other benefits,” he adds.